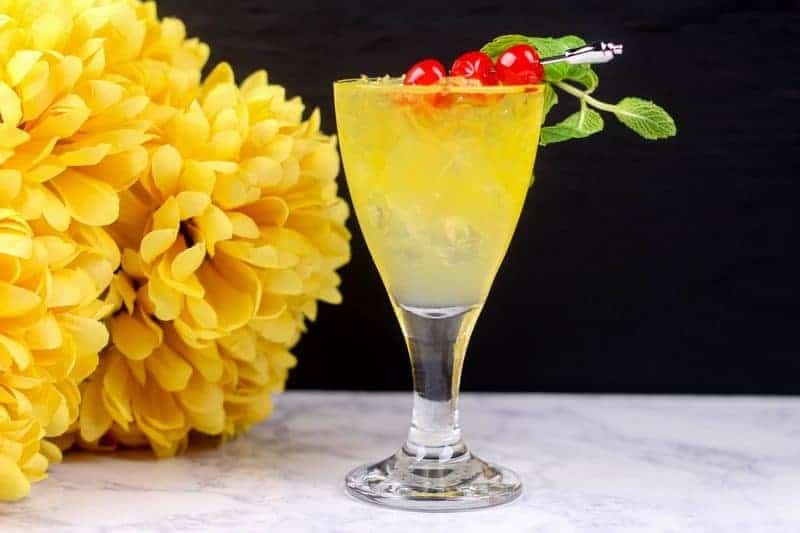 Gold Mint Baby Shower Mocktail Recipe: Perfect for Co-Ed Showers! 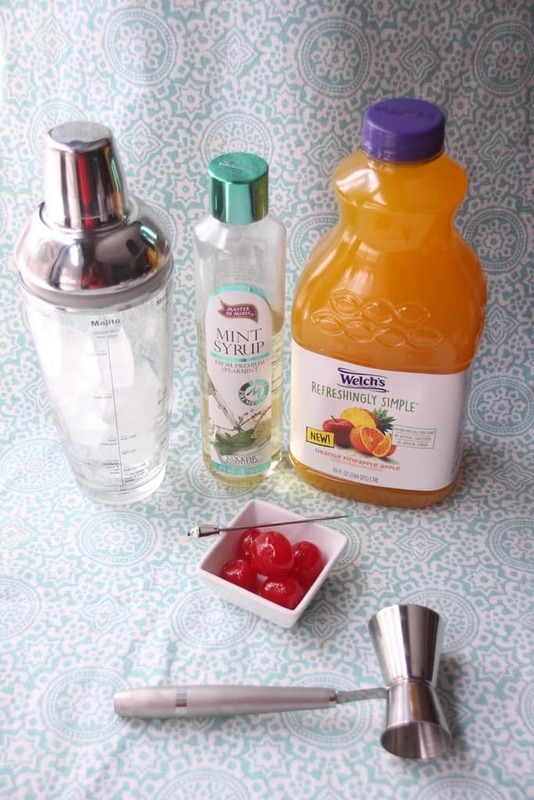 Do you have a favorite baby shower mocktail recipe? Tell me all about it in the comments! We did a fun Jack & Jill type baby shower for my brother and sister-in-law. Since my family lives all across the Northeast, it was easier on everyone. Besides, we don’t get to see my brother too often since he lives three states away, and he wanted to spend time with the family too. We didn’t want just to kick him to the curb! Since everyone had to drive home afterward, we didn’t want to have alcohol at the party. Aside from the fact that Jennie couldn’t drink it, I didn’t want to be responsible for anyone driving while under the influence. I certainly didn’t have room for everyone to stay at my house! If you do plan a co-ed baby shower, the guys will love this baby shower mocktail as much as the girls. It’s a nice change from the baby pink and blue mocktail recipes. Ready to find out how to make it? Let’s go! In a cocktail shaker add the pineapple juice, mint syrup, and a single ice cube. Secure lid and shake, shake, shake for 30 seconds. Strain into a glass filled with crushed ice. If you don’t have a cocktail shaker (I don’t), you can also make it in pretty much any cup with a lid. As long as you can shake it, you can make it! In a pinch, use a blender on a very low speed. In a cocktail shaker add the pineapple juice, mint syrup and a single ice cube. 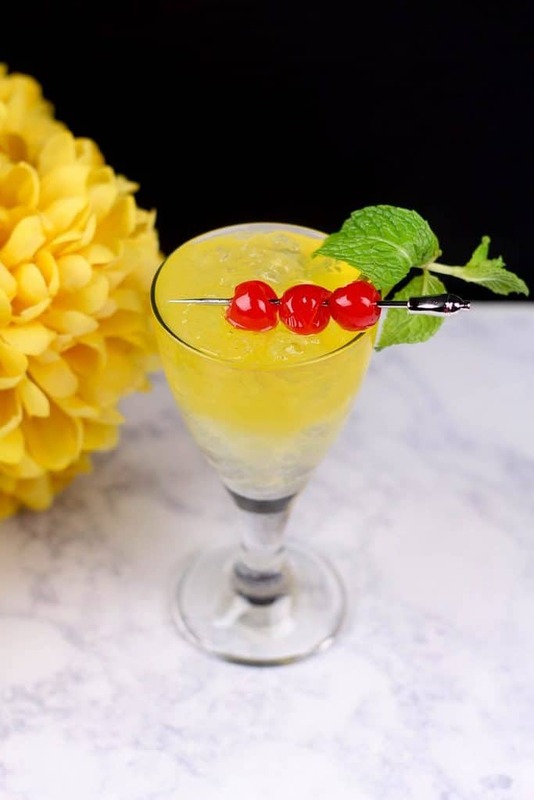 Since not everyone likes pineapple, it’s a good idea to add a few other mocktail recipes to your baby shower menu. 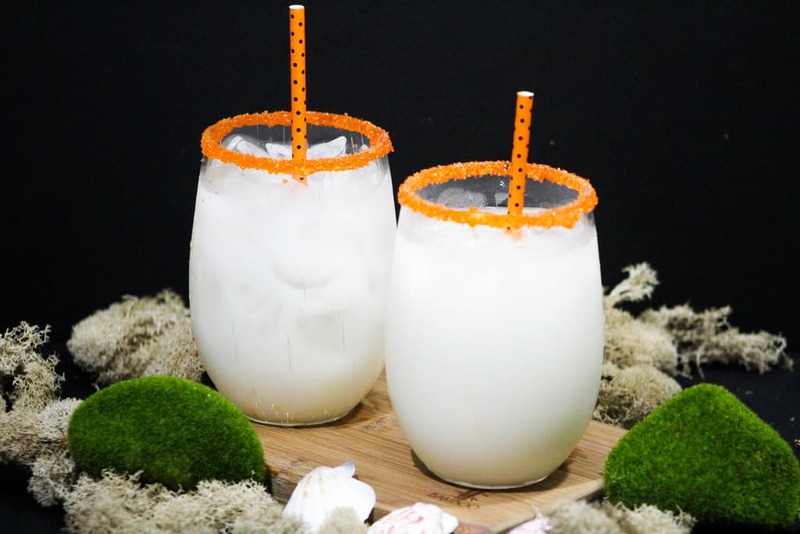 I love our Jungle Book themed coconut punch mocktail. Although we originally wrote it as a drink for kids, it works fabulously as a co-ed baby shower recipe too. If you do want something a little brighter, our tropical strawberry lemonade summer drink recipe also makes a fabulous baby shower mocktail. You can even use it as a very subtle gender reveal drink by choosing a pink or blue candy to add to it! This looks festive and refreshing! Thank you for sharing at TOHOT. Loving this recipe combination of mint and pineapple juice! I like that it’s mocktail but it doens’t look it! But then it could be!Thanks for linking up to Merry Monday! Pinned! Have a great week! Beautiful! And so perfect for a mom to be! Would love to have you share it on the What’s for Dinner link up! My goodness, that looks like a yummy mocktail right away seeing that mouth watering picture. The recipe looks so easy to do & I love Pineapple Juice so much that I would like to try this one right away. Mocktails are super fun and even adults enjoy them! I really think this is perfect for parties even if it’s not a baby shower. It looks so refreshing, it’s good to serve during barbecues too. This looks delicious! I need to try it, I don’t drink so this will be perfect! 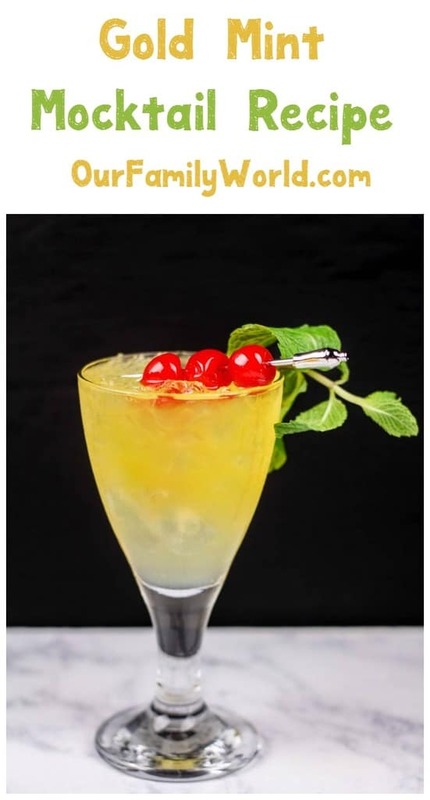 I love me a tasty mocktail but have never made them myself. These look pretty darn good and applicable to other events, as well. Love the presentation. And My Teen Lost His Phone, What Did I do? Should Fast Food be Banned from School Zones to Prevent Childhood Obesity?